Are you a commercial or industrial property owner in Montgomery County, Maryland, looking to improve your business’s bottom line through energy improvements to your property? Are you in need of a flexible, no-money out, affordable loan to complete the funding for the project? The Commercial Loan for Energy Efficiency and Renewables (CLEER) could be the right financing solution for you! You can get the brochure here. CLEER loan terms can be set to allow energy savings to offset the costs of financing the improvements — a cash flow win for your business! You can use the loan for any energy efficiency measures. You can use if you are only doing solar PV installations. You can use the loan to cover any costs associated with Building Tune-Ups. Nonprofits may be eligible for reduced fees – contact your lender to find out more. Loan terms can be set to allow energy savings to offset the costs of financing your improvements – potentially making your project costs neutral to your bottom line. CLEER helps you finance costs that utility incentives or other grants do not fully cover in your scope of work, including solar PV and energy storage. CLEER was created through a partnership with lenders. It is available through our current lending partners, Ascentium Capital LLC and Revere Bank. As a nonprofit helping Montgomery County businesses do more in energy efficiency and renewable energy projects, the Montgomery County Green Bank set about creating this loan product to help you move ahead with your project on uniquely favorable terms. common ownership communities (e.g., condominiums, cooperatives and planned unit developments). Properties must be located in the Pepco service area of Montgomery County, Maryland, to be eligible. 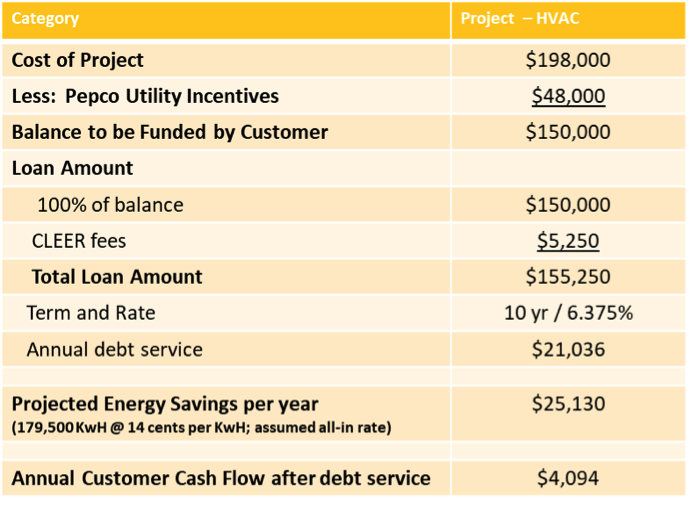 Loan proceeds can be used for a variety of energy efficiency measures – including all Pepco Energy Savings for Business Eligible Measures PLUS solar PV, Energy Storage, and HVAC (gas). While some CLEER financings may be able to exceed $250,000, owners of properties considering large energy efficiency projects should also consider Montgomery County Commercial PACE. While not a Montgomery County Green Bank product, you should explore it to determine if it suits your needs. Information on the County’s PACE program may be found at the following link: http://mocopace.wpengine.com/.